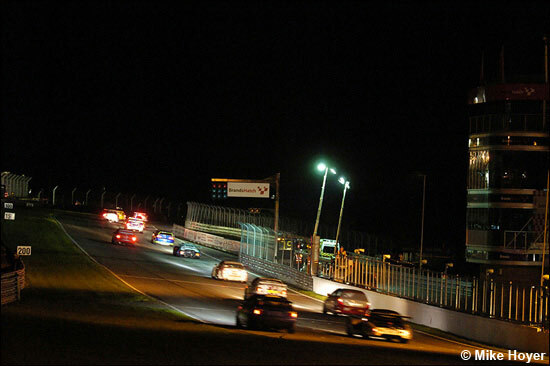 14 cars stayed on for the night race early on Saturday evening (17.10 start, 18.30 curfew), and around the Indy circuit, in the dark, that was enough to create an interesting race. The winners turned out to be Trackspeed boss David Ashburn and old mate Fred Moss, but the way they achieved the win takes some explaining. Blue skies throughout the day signalled a frost to come, and on such a cold track, at least one team debated running on intermediates. But slicks it was for everyone, and Nigel Greensall put the new Chad 997 on the pole (49.053), with David Ashburn half a second slower. Ashburn wasn’t happy with the Trackspeed 996’s lights – or the headache he couldn’t get rid of. Perhaps he drives better with a headache? Aaron Scott was third quickest in the Shiltech Ferari 360 (also in the 49s), while in the 50s were Kevin Clarke in the silver BMW (that had gone so well in the Open Race), and the Topcats Marcos. 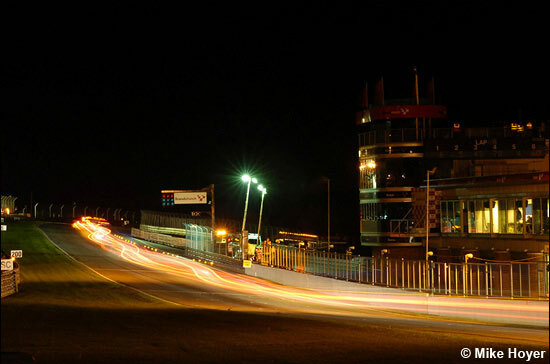 Pit stops were due to last – remember these numbers – 105 seconds for GT3 cars and 90 seconds for GT Cup cars. 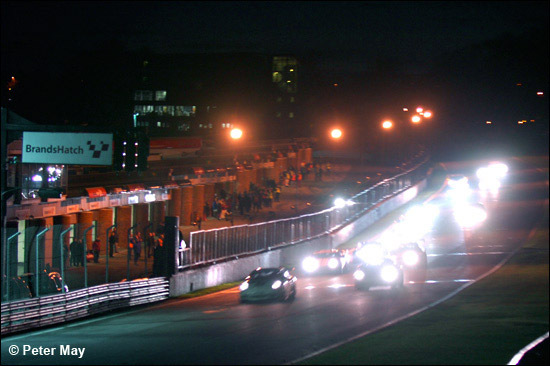 As with the Open Race, the cars completed a ‘racing lap’ behind the Safety car, to help the drivers warm their Dunlops. But the #75 BMW of Dominic Evans was straight into the gravel at Paddock, so the Safety Car was in action immediately. Lap 8 and they were racing for almost the first time, and it was Greensall against Moss in the Porsches at the front, then David Back in the Ferrari and Clarke’s BMW. Back soon spun at Druids, then had the black and orange flag waved at him, which was the cue for Aaron Scott to charge from several laps down – all the way up to fifth at 18.30. 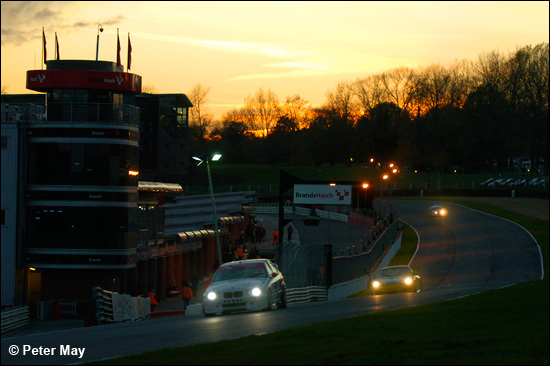 The silver BMW dropped back from the Porsches initially, then began to find its cold weather pace – but by lap 15, Greensall was 6.6 seconds ahead of Moss and 16 ahead of Clarke. 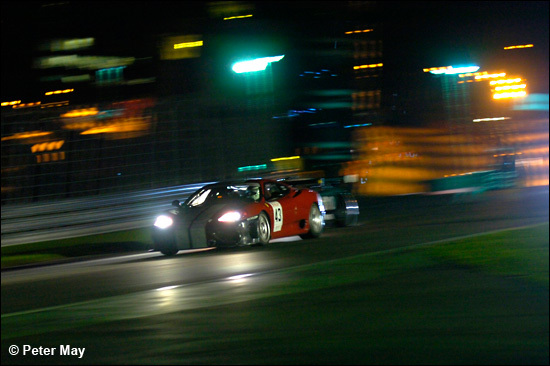 He was being unkind about his own form: half a second or so off Greensall in a 997, in the pitch black, was mightily impressive. Michael Symons and Ed Pead were grappling over the PS1 lead in fourth and fifth (although in different classes), and the two Mantis were next, Harrison for Topcats leading Hancock for Jemco. The silver Mantis soon split the PS1 cars, but all three had been lapped by lap 21. Pit stops began on lap 25, but of the first three, only Clarke in #78 chose to pit quite early: Greensall and Moss carried on their battle, the gap out to 24 seconds after 35 laps (47 of 80 minutes to go), Clarke now three laps down – for now. Symons and Pead ran third and fourth, five seconds apart. 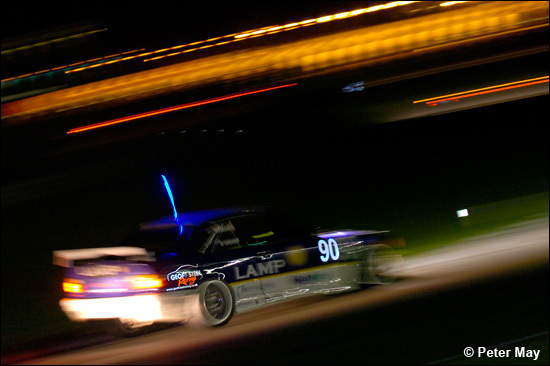 Lap 52, 33 minutes left, and none of the first three had pitted: Greensall, Moss and Hancock in the Jemco Mantis – but Asburn was readying himself. Lap 54 and Moss pitted from 36 seconds behind. Then the Morgan retired after a driveshaft bolt broke, the ‘shaft damaging the rear brakes. Lap 55 and Greensall was in: two laps later, with Iain Dockerill settling in with a first flying lap of 53.6 (Asburn 50.8), the gap was 43 seconds. It must have been more initially – so how did Chad Racing manage to extend the lead? We didn’t know at the time. But 43 seconds advantage with over 30 laps to go didn’t look secure at all. Dockerill was in the 52s, but Ashburn was in the 49s. At this rate, 15 laps should have been enough to see the lead change. But he did get quicker, down into the 51s – and the typical difference in lap times became a second and a half or so. Lap 64 and the gap was 27 seconds – then 25 – then 25 again – then 25 again. What had changed? “A blue Honda cut across me at Graham Hill Bend,” said the now headacheless Ashburn afterwards. “That screwed the steering, but the boys told me to stay out.” It was a good job he did. 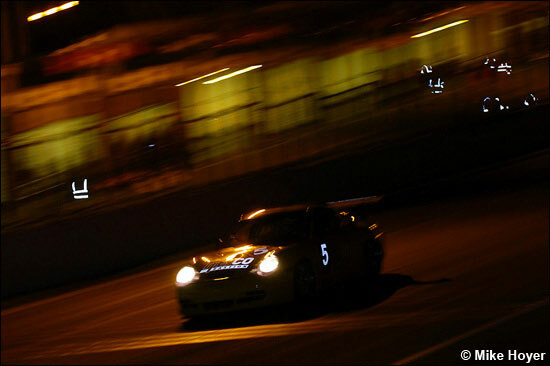 Now that man Clarke was catching both Porsches – and was looking very strong in third place. The Topcats Mantis was charging along in fourth, ahead of Andre D’Cruze in #90, then Aaron Scott in the Ferrari – lapping just as quickly as anyone. From here to the flag, the gap between the Porsches stayed remarkably regular: it came down to 21 seconds in the end, by which time Clarke was only eight seconds behind Ashburn. But what’s all this? Four laps from the end it became apparent that the Dockerill / Greensall 997 had been granted a 75 second penalty for not remaining stationary at its stop for the required time. Eh? That’s unlike Chad Racing. All very confusing, because the Porsches were listed as GT3s on the results for both races. Trackspeed seemed to know what was going on though – hence the increased gap after the stops. 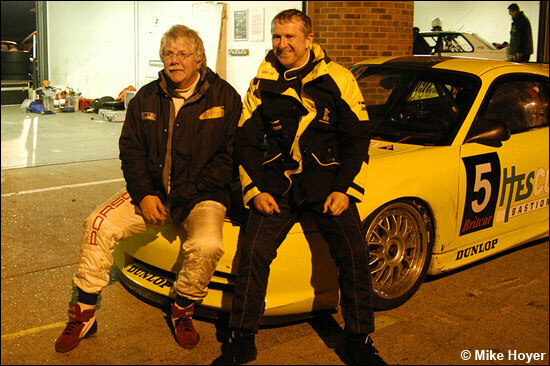 Fred Moss reckoned that this was David Ashburn’s first win in a GT car. Ashburn reckoned that Moss “hasn’t retired”. Here are the smiling winners. 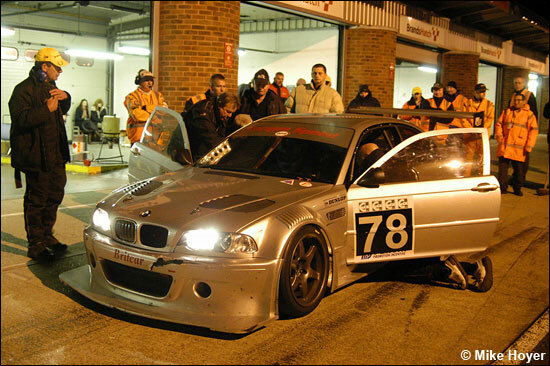 So Kevin Clarke finished second in the lovely silver BMW, Chad slipped to third, Topcats’ Mantis was fourth, Aaron Scott / David Back fifth – and the three PS1 class winners were sixth, seventh and eighth. 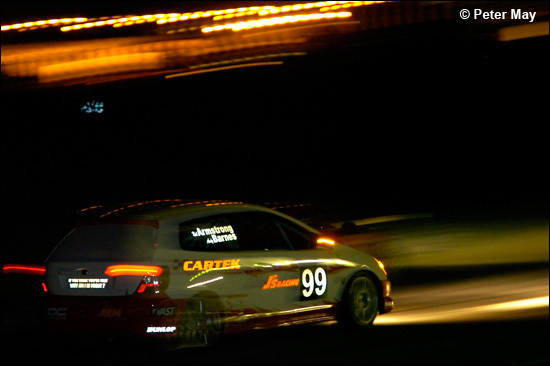 Mark Lemmer was “eating tyres” in #60, while the #99 Honda was as short of gears as it had been in the Open race. Adrian Watt and Nick Jacobs were ninth and the Jemco Marcos rounded out the top ten. 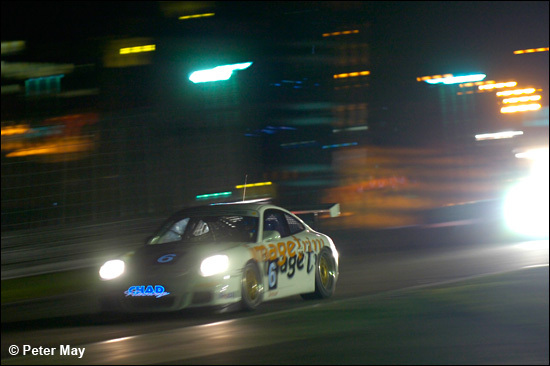 It was an odd way to end the domestic GT season – after what had been a very good race.